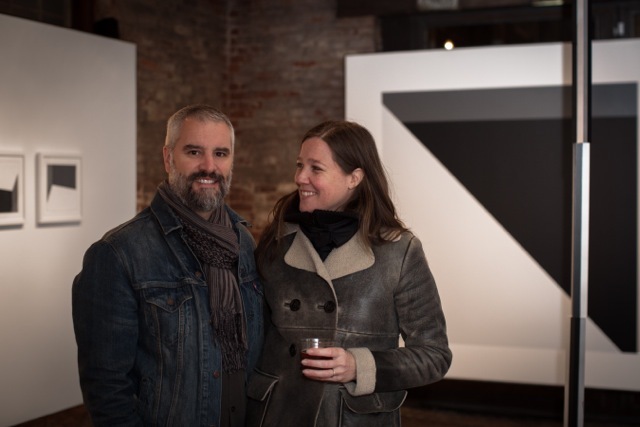 Below freezing temperatures couldn’t keep the crowd away this past Thursday evening at whitespace gallery for the opening reception of Build A Fire. Pete Schulte’s newly installed exhibition incorporates graphite drawings, large wall drawings, three-dimensional pieces, and a music component. Schulte created all of these works with the particular gallery spaces of whitespec and whitespace in mind. Visual and conceptual themes carry from one piece to the next in a subtle and pleasing manner. Schulte intends for his work to suggest varying meanings and encourages viewers to actively discuss their thoughts and ideas during their visit. Discussion is exactly what ensued Thursday night. Both main rooms in whitespace were filled with people experiencing Build A Fire for their first time. Everyone had the luxury to openly converse with Schulte about his work and inspirations. If they weren’t picking Schulte’s brain, groups were speculating amongst one another: What is the significance of the instrumental music? How does “The Clock” tell time? Are the grooves in “The Clock” related to the grooves on the vinyl record featured in “A Letter Edged In Black”? A steady flow of people braved the cold to venture over to whitespec, a small project space, to view an additional two pieces featured in Build A Fire. The pieces in whitespec nicely demonstrate Schulte’s thoughtfulness throughout his creation and installation process. The first piece, “X”, confronts the viewer as they enter whitespec. The stark white form of the X wraps around its dark graphite counterpart to create the illusion that the drawing is receding in space. “X”, located on the wall facing the entrance, draws the visitor into the physical space of whitespec. Next, one encounters “Lying In State”, a 144 inch-long three-dimensional rectangular aluminum piece. “Lying In State” rests peacefully in the middle of the brick floor and is surround by bare brick walls that have been painted white. The expanse of the piece invites the viewer to circumnavigate the entire space and view the object from all angles. Every other work featured in whitespace was designed and installed with just as much intention and thought as the two pieces in whitespec. “Broken Line Drawing”, another aluminum piece, is installed in a main room of whitespace. Many visual similarities can be noticed when comparing “Lying In State” and “Broken Line Drawing”. It is thought provoking to consider each aluminum object with the other in mind. Visitors will find themselves revisiting certain works and drawing new connections after they encounter other pieces later on in the exhibit. The deliberate attention given to the placement of each piece within whitespace creates a unique, introspective experience for every visitor. This entry was posted in Uncategorized on February 27, 2015 by blog814.